In addition, the city has approved 26 ships to be transferred, change of ownership; terminated operation of 41 ships. According to the People's Committee of Ha Long City, there are currently 504 cruise ships and 68 speedboats operating on Ha Long Bay and Bai Tu Long Bay, of which 478 vessels are operating in Ha Long Bay. There are no yacht or sailing boat licensed to operate in the bay. At a meeting on assessing the state management of cruise ships, boats in Ha Long Bay, the chairman of Quang Ninh People's Committee Nguyen Duc Long noted the management of Ha Long Bay not to increase the number of cruise ships according to the direction of the province, replace the wooden boats with iron ships. Quang Ninh Provincial People's Committee Chairman Nguyen Duc Long emphasized that newly built ships must meet higher quality requirements and improve capacity to reduce the number of ships. In the adjustment plan, management of canoe and kayaks should be added, and a detailed schedule should be put in place for high-quality ships, study the planning of the wharf area, supplement the tall on cruise ships operating on the bay. Long also asked the Ha Long Bay Management Board to set up a Center for Visitors to Halong Bay at Tuan Chau International Passenger Dock. 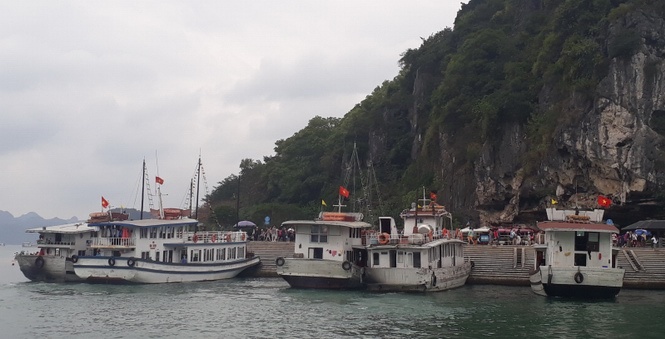 The functional agencies should intensify the inspection, examination and strict handling of cases of non-execution and violation of regulations on transportation in Halong bay.